Count the 12 Days of Christmas with these holiday gift tags! For a fun twist on a Christmas tradition, give your child a small present on each of the 12 Days of Christmas, from December 25th until January 5th. You can give each gift to your child one-by-one, or affix all twelve tags to the presents, then let your child open them on each Day of Christmas! 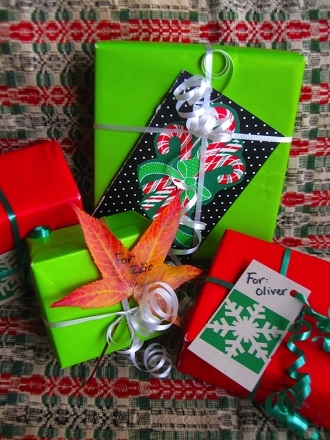 DIY gift tags make any holiday gift more special. Make these DIY gift tags with your child. Your family will love receiving gifts with these printable Christmas gift tags when they've been colored in by your preschooler. These printable snowflake gift tags will make any gift look pretty! Just print them, clip them, and have your little one help you fill them out. Make things a little easier this Hanukkah by using these colorful printable gift tags! Just print out on business card paper and you're ready to go. These colour-your-own holiday gift tags are a fun activity to share with your little one. He'll love to help you colour and decorate them.